A special exhibition in association with Nicholas Price Fine Art. 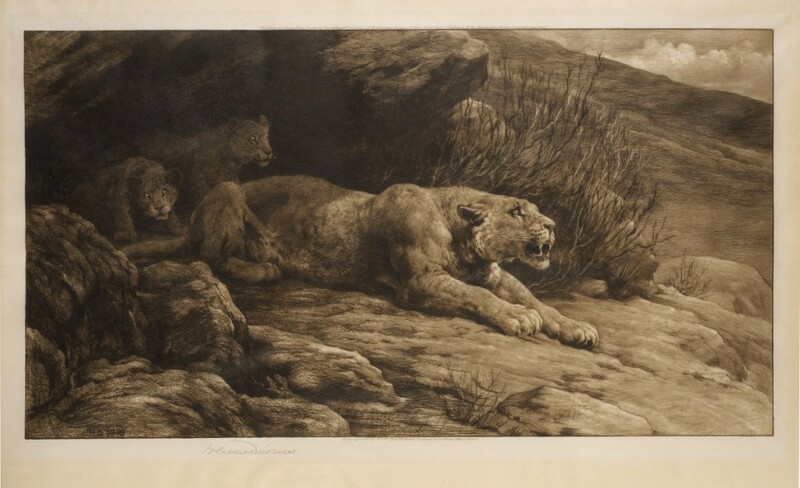 One of the greatest wild animal artist of his generation, Herbert Dicksee became an expert in the observation of the character and behaviour of his animal subjects, in particular the power and majesty of lions, tigers and other big cats. 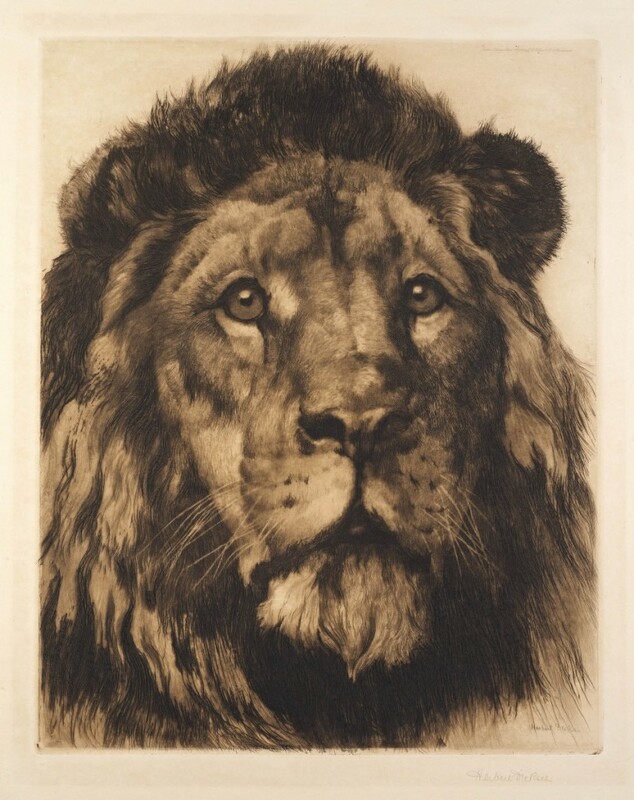 He was one of the first generation to create images of rampant lions and powerful tigers in such a realistic and awe-inspiring style, working in an era predating the the invention of the camera zoom lens. Although he was equally adept in painting in oils, he distinguished himself in his prints by his naturalism, originality and daring use of the power of black & white images. According to a 1906 article about Dicksee in the Windsor Magazine “…he used to rise at 6 o`clock in the morning to visit the Zoological Gardens before visitors could arrive and obstruct his view. 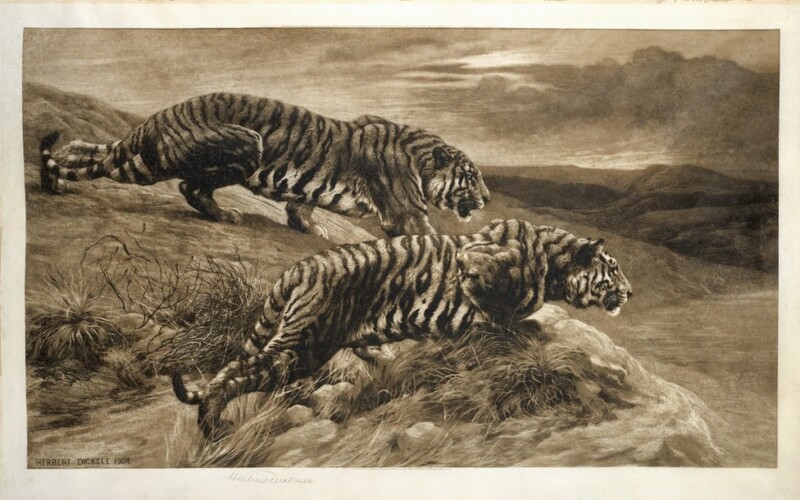 There he would be seen, morning after morning, making sketches of the lions and tigers in the reposeful intervals of their restless movements.” And again later: “Mr Dicksee is a very painstaking artist and spends at least three or four months over each plate.” He was later elected to become a Fellow of London Zoo, given his frequent visits there to sketch. With the assistance of keepers, he used various ruses to persuade the animals to adopt the natural poses he needed to stimulate ideas for pictures. Dicksee was a most meticulous exponent of his technique, yet he also shows, on many occasions, a notably free facility of line. 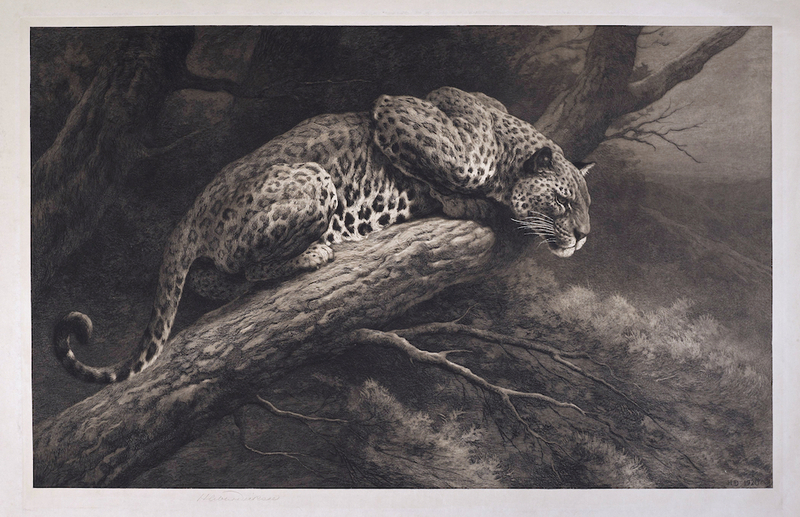 A naturally gifted draughtsman with a profound knowledge of the character and behaviour of his animal subjects, his etchings were produced to a remarkably high standard. His seemingly effortless ability made him a perfect exponent for the interpretation of the feelings and thoughts, as well as both the power and gentleness, of his subjects. The art of printmaking took time because of all the detail. Once the design had been worked out the outline was etched onto the plate; this required good, lively drawing with work that also required great skill and judgement – especially since each correction reduced the number of prints that the plate would yield. 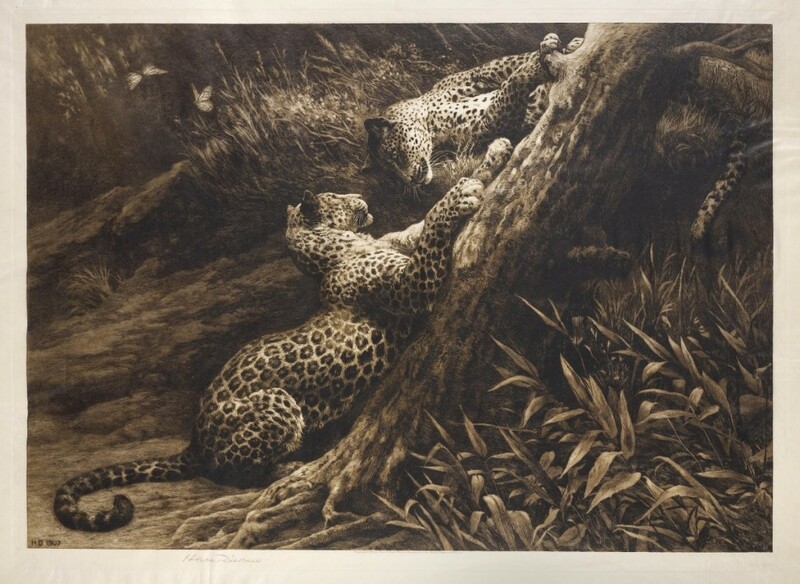 As a draftsman whose technical curiosity led him to bend the normal conventions of printmaking to his own purposes, Dicksee was able to produce works of exquisite delicacy and beauty with fine effects of light and shade. He would produce only one, fully finished, state of each subject in almost photographical quality. Herbert Dicksee was born in 1862, and studied art at the Slade School of Art on a scholarship, later assuming the role of Drawing Master at City of London School in 1895, a position he held until 1927. His first painting in oils was exhibited in 1881, and thereafter well over 300 of his works were shown in various galleries which included the Fine Arts Society, Walker Art Gallery Liverpool, Glasgow Institute of Fine Arts, and the Manchester City Art Gallery. 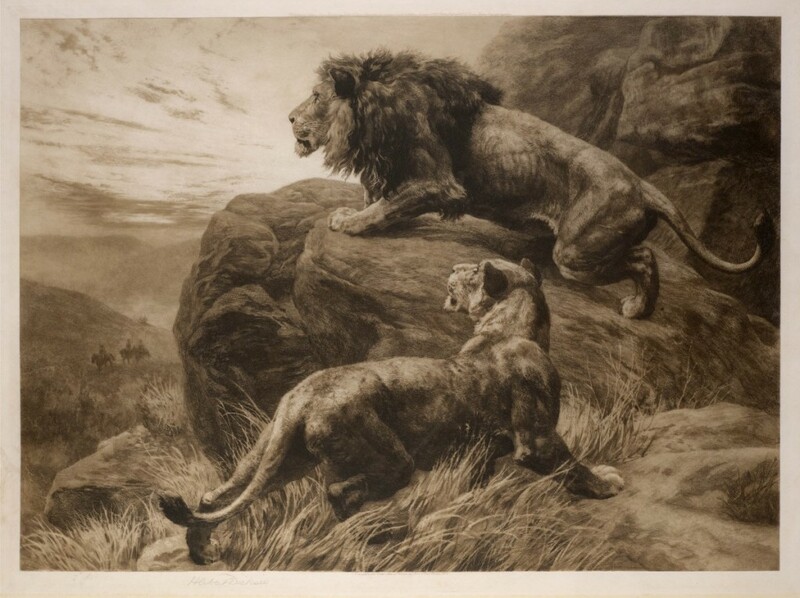 The majority by far, however, were displayed at the Royal Society of Painters, Etchers and Engravers as well as at the Royal Academy where 97 images were hung between the years 1885-1933. It is worth noting that of his 14 exhibits displayed at the R.A. from 1920 onwards, only one was in oils. He dies at home in Hampstead in 1862, with his daughter appointed executor to his will, which instructed her to destroy most of the plates used for his etchings.